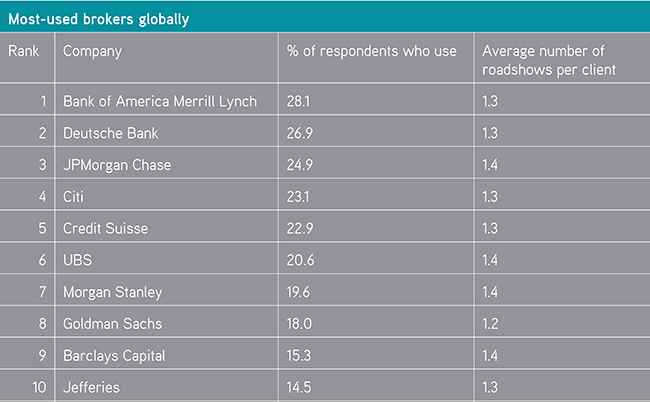 Companies are once again most likely to go on the road with Bank of America Merrill Lynch, according to the Global Roadshow Report 2017 from IR Magazine. But Deutsche Bank has climbed four spots to knock JPMorgan Chase from second to third place, while 2016’s third-placed broker – Credit Suisse – falls to fifth. Overall, 28.1 percent of the 750 companies that took part in the research used Bank of America Merrill Lynch for roadshows over the past 12 months. But while this means the bank retains its pole position, it represents a 3 percentage-point drop on the previous year. In fact, this is part of a wider multi-year trend that has seen companies slowly reducing their reliance on the big brokers. The 2016 report saw every bank in the top 10 experiencing a drop in their share of the global roadshow market – and this year is largely the same, with eight of the top 10 brokers seeing yet another drop in percentage use. Only two buck the trend: Deutsche Bank, used by 26.9 percent of companies in the last 12 months, up from 22 percent in 2016, and Citi at 23.1 percent, up from 21.8 percent. In the top 20, there are just two companies that didn’t make the 2016 list: 2017 sees Wells Fargo and Nomura falling off, with Bank of Montreal and CLSA replacing them. Clients of Kepler Cheuvreux (formerly CA Cheuvreux) use the company most frequently for roadshows: the 6.8 percent of firms that went on the road with the broker typically did so 2.7 times in 2017, compared with the average of 1.4 roadshows per broker. Click here to download the full Global Roadshow Report 2017.